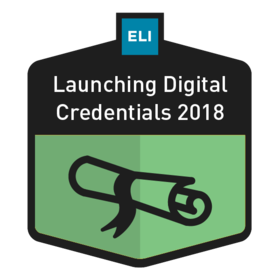 This badge recognizes those who successfully completed the ELI course: Launching Digital Credentials 2018, as well as all related projects or activities. Individuals who earned this badge successfully engaged in and completed a 4.5-hour course facilitated by community experts on Launching Digital Credentials. Badge earners completed all assigned projects and activities related to the course's learning objectives. Yes, make EDUCAUSE a Trusted Issuer. This will automatically accept all pending and future Credit from EDUCAUSE. By removing trust, badges created by EDUCAUSE are no longer automatically accepted and you'll need to review in your inbox before accepting.